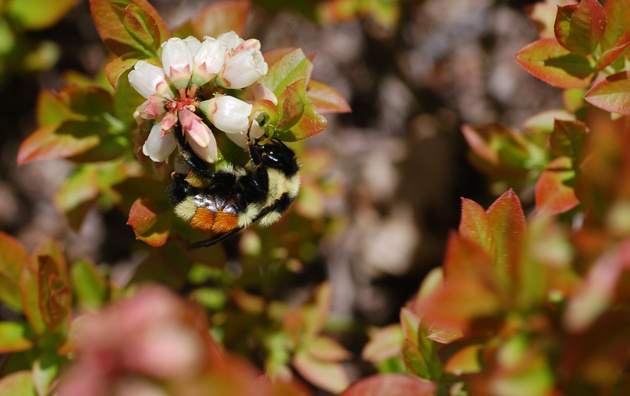 Above: Queen orange-belted bumblebee (Bombus ternarius), foraging on wild lowbush blueberry blossoms in the spring. Photo credit: Eric Venturini. Courtesy University of Maine Pollination Security Project. Farmers, gardeners, the USDA, and a profusion of public and private groups all across the globe are increasingly concerned about the future of pollinators. If you attend agricultural conferences, fairs, or grower meetings you will be well versed on the buzzwords: migrant bees, colony collapse disorder, wild bee declines, varroa mites, and many more. As a farmer or gardener, what does this buzz about bees mean for you? 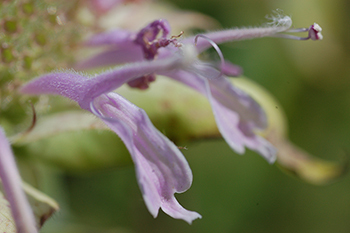 Blooming wild bergamot (aka bee balm) serves as a bee forage plant. Photo credit: Audrey Maddox. Courtesy University of Maine Pollination Security Project. In the fall of 2006, beekeepers first started noticing unusually high levels of overwintering mortality in their hives. The term colony collapse disorder (CCD) was coined to denote the phenomenon that researchers generally agree is being caused by a multitude of factors, including parasites, viruses, stress, and pesticides. Regardless of the root causes, the number of honeybee hives that growers can rent for pollination also continues to decline. This decrease becomes even more concerning with the increasing trend for acreages of crops that require pollinators. This mismatch between the supply of pollinators and our demand for them has caused an increase in the prices farmers pay to rent honeybee hives. California almond growers that used to pay $60 per hive in 2002 now pay over $200. In Maine, blueberry growers that paid $45 per hive in 2000 now pay over $100. Pollination problems have hit the pocketbooks of farmers. Why Are Pollinators So Important to Growers? 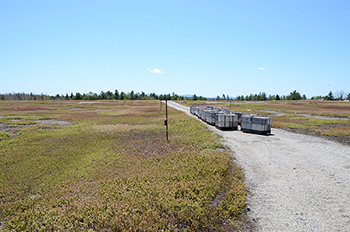 Rented honeybee hives, stocked in a commercial blueberry barren in Maine. Photo credit: Frank Drummond, PhD. Courtesy University of Maine Pollination Security Project. Apple production in China offers us a compelling example. In certain regions of Sichuan, China, wild bees have virtually disappeared. Chinese apple growers in this province now pollinate each and every blossom by hand. As you can imagine, it would be difficult if not impossible to run a profitable farm in the United States if all pollination were done by hand. Nonetheless, farmers are an imaginative bunch. Although honeybees are still available to American growers, many are thinking ahead and taking steps to secure the future of pollination on their farms. At Johnny's Selected Seeds, we utilize flower plantings, beneficial insects, and other integrated pest management (IPM) strategies that support pollinators. Johnny's also supports growers' pollinator enhancement efforts by providing seed for plants known to Attract Beneficial Insects, including a Bee Feed Mix and our Beneficial Insect Attractant Mix, along with technical advice needed to successfully manage pollinator populations. See our article on Attracting & Putting Beneficial Insects to Work to learn more. In 2008, the US Farm Bill prioritized pollinator habitat, ultimately resulting in a number of programs that can help growers to defray the cost of installing pollinator habitat and bee pasture. 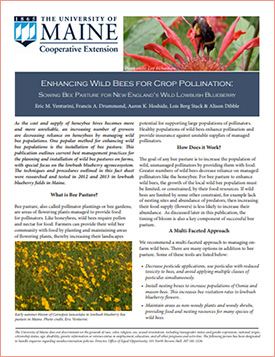 See the USDA's publication for more information on specific Programs for Pollinator Conservation and how to apply.